Back when I was growing up, just about every family I knew had a closet full of tattered board games, ready at a moment's notice should said family come dangerously close to just quietly sitting and enjoying each other's company. Now EA introduces the 21st century version of said dusty closet, Hasbro Family Game Night for the Nintendo Wii and PlayStation 2. The title contains a nice selection of six big-name board game favorites - Battleship, Yahtzee, Boggle, Connect Four, Sorry!, and the all-new Sorry! Sliders, each with its own twist for fresh gameplay. 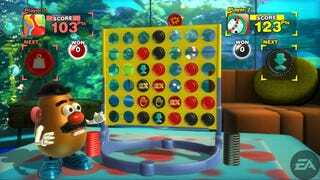 Connect Four gets power chips, Bobble gets portal cubes, etc. As a special added bonus, each game is hosted by Mr. Potato Head. Apparently we needed a host, and he was available. If you ever wanted to get you parents into gaming, Hasbro Family Game Night will probably be your best chance when it comes out this Fall. Guildford, UK. - May 16, 2008 - Join your host MR. POTATO HEAD for fun and games with family and friends like never before. From the Casual Entertainment Label of Electronic Arts Inc. (NASDAQ: ERTS) comes the fun-filled video game HASBRO FAMILY GAME NIGHT, launching Autumn 2008 on Wii™ and the PlayStation®2 computer entertainment system. Featuring six games including: BATTLESHIP, YAHTZEE, BOGGLE, CONNECT FOUR, SORRY! and the all new, SORRY! Sliders, HASBRO FAMILY GAME NIGHT is sure to become a valuable family favorite. With the HASBRO FAMILY GAME NIGHT digital experience, families can enjoy familiar classic Hasbro board games or throw in a fun spin with new versions like CONNECT FOUR Power Chips, BOGGLE Portal Cubes, Reverse YAHTZEE and BATTLESHIP Barrage - which add fresh dimensions and challenges to these legendary favorites. Play with up to four people in YAHTZEE, BOGGLE, SORRY! and SORRY! Sliders or up to two players in CONNECT FOUR and BATTLESHIP. Players can deck out their very own distinctive digital game room in HASBRO FAMILY GAME NIGHT by choosing a setting and adding earned trophies, cool furniture and decorations all themed to their favorite games. Not only can players customize where they play, but also how they play. HASBRO FAMILY GAME NIGHT features a party mode that gives players the option to build a custom party game by choosing their desired game(s), number of players and setting a time limit. Party mode mini-game challenges include Match the Pattern, Shake for Words and Bomb Run. "We're giving families a new way to bond and play together," said Chip Lange, Vice President and General Manager of EA's Casual Entertainment Label. "HASBRO FAMILY GAME NIGHT offers parents and their children a digital party experience full of classic brands they know and love. Between original and new rule settings, an easy-to-play party mode and a customizable game room feature, the variety and choice promise hours of fun family play." "HASBRO FAMILY GAME NIGHT is designed to bring family and friends of all ages together in the digital living room for an evening of 'anything goes' fun," said Mark Blecher, General Manager of Digital Media and Gaming at Hasbro. "Hasbro has been providing families with the best in game play for decades, and now they can enjoy some of our most beloved brands with an all-new digital twist." For HASBRO FAMILY GAME NIGHT screenshots and assets, please visit www.electronicarts.co.uk/press.